Brussels Sprout Au Gratin is a new way you can prepare Brussels sprouts. 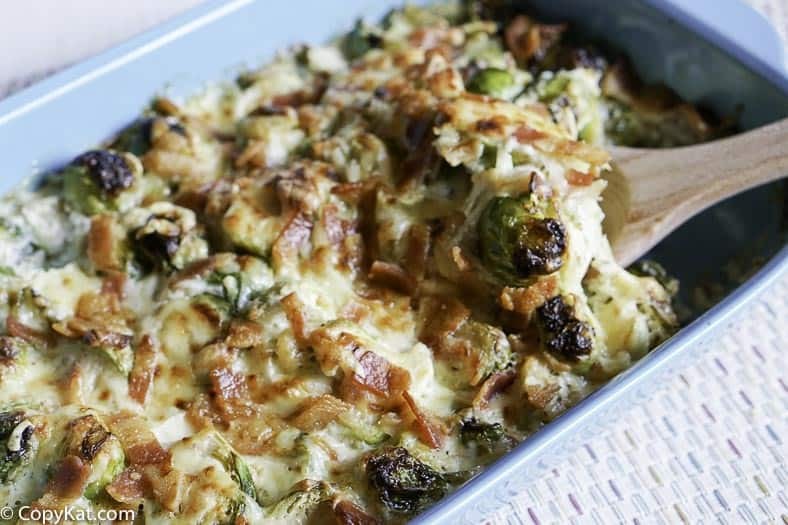 Brussels sprouts are baked in a creamy cheesy sauce with crispy bacon. Brussels sprouts are a popular side dish that many of us have had them baked in the oven before, but have you had them in a classic French Au Gratin? This dish combines a creamy cheesy sauce that has lots of crispy bacon inside. The Gruyere adds the perfect flavor to accompany the Brussels sprouts, and I know this side dish will soon make it into your recipe box. 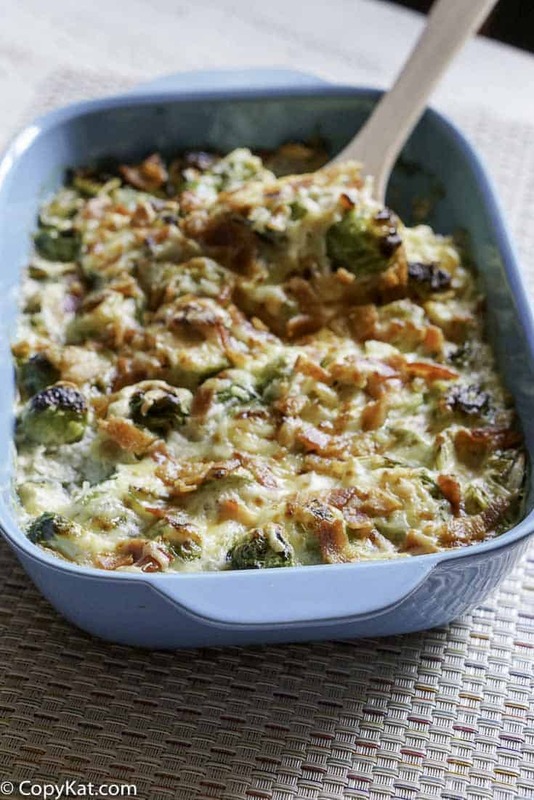 This Au Gratin is very easy to put together, I like to buy my Brussels sprouts at Costco, they come in a 2-pound bag where the Brussels sprouts have already been cleaned and trimmed perfectly. You can purchase your vegetables anywhere you like. I simply slice the fresh sprouts in half and pour them into a 9 x 13-inch baking dish. Then I top with them the cheesy sauce add some bacon, and place into the oven for about 45 minutes. So this is a low maintenance dish, it is perfect to toss this into the oven while you prepare your dinner. The creamy cheesy sauce is a simple white sauce that we add lots of freshly grated Gruyere cheese. Gruyere cheese offers you a nice nuttiness that you will find irresistible. I like to grate cheese just before it goes into a sauce, I believe it melts better when you do it like this. So often when you buy pre-grated cheese it comes with an anti-caking agent on it that can slow down how well a cheese will melt. They do it this way so when you buy a package of shredded cheese it isn’t a large clump of cheese. What makes this dish so easy it that once you pour the sauce over the Brussels sprouts into the pan you will simply place the pan into the oven, and let them bake off. You can reheat this later, so this recipe would be great to make ahead and reheat later. I hope you give this recipe a try soon, it is so easy to put together. Brussels Sprout Au Gratin are easy to make, and they reheat so well. Preheat an oven to 350 degrees. Wash, trim and cut Brussels sprouts in half. Place Brussels sprouts into a 9x13-inch baking dish. In a medium-size saucepan over medium heat add 3 tablespoons of butter. When the butter has melted add the flour. Whisk together the butter and flour and continue to cook for about 1 minute. The butter and flour mixture will become fragrant like pie dough. Slowly add in the milk and continue to whisk. The sauce will thicken. When all of the milk has been incorporated into the sauce continue to stir and cook until the sauce thickens. Season with salt and pepper. Slowly add in the cheese and stir to incorporate the cheese into the sauce. Cook until the cheese has fully melted. Pour cheese sauce over the Brussels sprouts, and then top with the crispy cooked bacon. Bake in the oven for about 45 minutes. Thanks for a delicious recipe. MY First time using gruyere cheese. Very flavorful, rich and creamy sauce. I needed to make a quick supper so I added shrimp. Cooking time was perfect. Sauce could be used for many recipes. Very good recipe. Used a different white creamycheese and added garlic. Can not imagine somebody thinking one could “slide” sprouts in half and could not figure it was a typo. Love sprouts and now bake them in my penne cream bake along with zucchini and what ever meat in the fridge. I used Gruyere, it is “swiss” cheese.